Though I manage to nourish three growing boys, I’ve killed most plants I have ever owned. However, that history didn’t get in my way this year, because, the thing is, everyone is doing it. Even the First Lady has one! I’m talking about having a vegetable garden. Backyard gardening seems to be the new rage, and since I have tried and failed to produce the kind of homegrown tomatoes that my mom always used to have using just pots, I made the plunge to a larger (albeit small still) garden bed. This house has ideal land, meaning our yard is in FULL sun, and with a nice sized yard, allocating space to a garden isn’t depriving the kids from ample play space. To start I pulled out some unidentified plants and a couple of poor performing azaleas (the weeds had overtaken that spot and the azaleas were stunted.) Well, maybe not. I know next to nothing about gardening. But I know that what was in this patch was ugly, wild and seemed to keep the azaleas from thriving. I bought a few yards of topsoil, and using a garden weasel that I found in the back of the garage (how we acquired that I have no idea) I “tilled” the soil for a while. Basically, I stopped when I was tired and the topsoil seemed to be mixed in with the existing dirt. Next I bought a few small plants: three tomato varieties, a thai chili pepper plan, a blueberry bush and a strawberry plant. Remembering the beautiful blueberry bush I bought from Whole Foods last year, and how the birds loved all those blueberries, I also bought the bird netting to install over the strawberry and blueberry plants. I also went crazy and bought seed packets for many other things: cucumber, snap peas, cilantro, dill, watermelon, basil and more. I started some in seed starter pods, and the rest were sowed directly into the fresh garden bed. Mistake #1: I forgot to mark what got planted where. So now I don’t know if I should thin some rows to 12″ or just 3″. And not knowing what is where, I have no idea what is successful and what is flopping. Mistake #2: The tall tomato plants (which are THRIVING) are throwing shade on much of what is around them. Its too soon to know how this will impact our yield this summer, but I have a feeling this isn’t great. Mistake #3: I packed too much into too small of a space. I was excited, and didn’t want to give up any potential garden delights. But I know in my heart of hearts that it is too crowded. Like the shade, I don’t know the impact yet, but I suspect I’m stunting much of the potential growth. Mistake #4: The tomato cages are too short. When I bought them and the choice was 36″ or 48″ I thought for sure the 36″ cage would be sufficient! Now I have regrets. I do hope that the size of these plants foretell a good bounty of tomatoes, as they are after all, the sole motivation for me to try this garden thing! Mistake #5: For all the organic eating that I adhere to, I didn’t pay attention to my seeds or plants and ended up with almost all conventional. Not a huge problem, as I’m not raising the garden with chemicals, but it would have been nice to be truly organic. Those mistakes aside, I’m pretty pleased with how the garden is going. Aside from a couple of days, I have let mother nature take care of the watering, and I have tended to the weeds as best I can (I don’t totally know which are weeds vs. new plantings emerging from the seeds.) 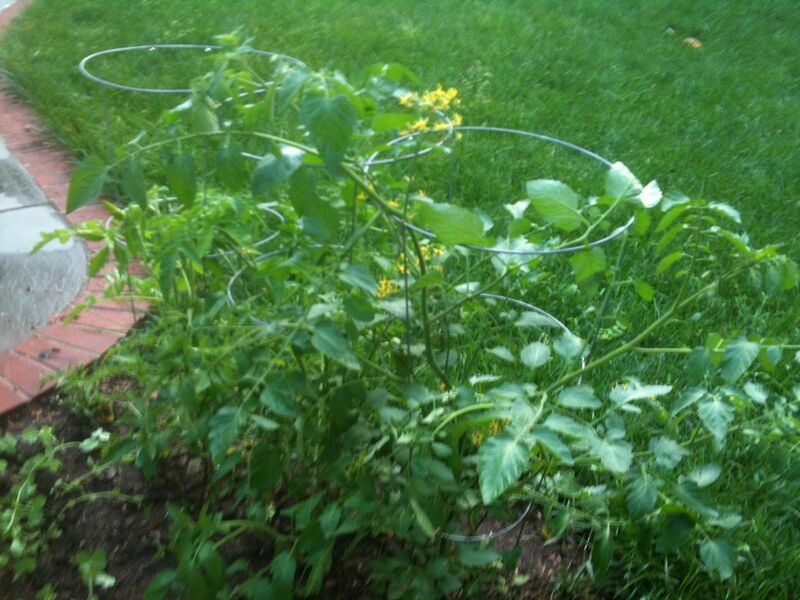 I have tried to thin some plants, and I see I need to add a trellis to support the snap peas. It is fun watching the kids watch the garden. The youngest is most invested in it, helping me till and weed and plant. The 7yo did the initial shop with me, and he likes tomatoes so he’s excited about those. The 9 year old just likes how fast things are growing, and hopes for a watermelon. Of course it is way too early to say that this will be a yearly habit, but a month into this experiment I am happy to have made the plunge into the backyard gardening thing. Now, if only I can learn the difference between weeds and vegetables, I’ll be on my way. It sounds like you have a nice garden started. We all make mistakes…trial by error. I have 48 inch cages for my tomatoes and they will grow to over 6 feet. I take a six foot metal fence post and hammer it through one of the rings on the cages. That way I have something to tie the tops to when the tomatoes outgrow the cages.